There is no consistency in chaplains' descriptions of what they do. Nearly every chaplaincy department has its own list of chaplaincy activities. Among other consequences, this lack of consistency is confusing for our health care colleagues and makes research across chaplaincy departments difficult, if not impossible. Can we create a standard list of chaplain activities that we will accept and use? Such a list will need to be thoughtfully and rigorously developed. Join us for this webinar to see whether the team that developed the list of chaplain activities reported in this article has met those challenges. 1. 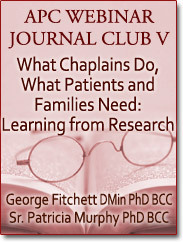 To make chaplains aware of a well-designed and research-based list of what chaplains do. 2. To make chaplains aware of important methods for testing the validity and reliability (essential properties of every good measure) of a list of chaplain activities. Reading: Massey K et al., (2015). What do I do? Developing a taxonomy of chaplaincy activities and interventions for spiritual care in intensive care unit palliative care. BioMed Central Palliative Care, 14, 10 DOI 10.1186/s12904-015-0008-0.